"We haven't really been working on Web2Messenger for quite a while now, but it's been silently running in the background doing what it's supposed to do. [..] People kept on bugging me about the [...] bug, [so] I took some time yesterday to try and fix it. For now it seems fixed, and in case it fails again I've added some event logging that should alert me to the exact place it's failing so I can pinpoint the problem easily". While the service isn't open to the public again just yet (due to server constraints), we here at Mess.be did get a bunch of invites to give away to our loyal visitors. We expect they will be used up pretty fast, so be sure to grab one as soon as you can! UPDATE: Sorry guys, all fifty invitation codes have been used. Better luck next time! TB has also let us know they are looking to improve their service by adding new features and servers, so if you end up getting a Web2Messenger account, be sure to send the team some feedback! Isn't it every company's dream for its name, brand or product to become a noun (eg. Coke, Kleenex) or even better, a verb ("to Google" and "to Skype")? As you may or may not know, "msn" (derived from the old MSN Messenger title) has actually become a verb in Dutch countries Belgium and especially The Netherlands. But according to various media sources, Microsoft is now trying to delete the verb 'msn-ing' from the most popular Dutch dictionary, Van Dale. Obviously, this is not entirely the case and the speculation has to be seen in the light of the cease and desist letter sent to Unicaresoft BV earlier this week. The company behind chat-blocker software MSNBLOCK reasons that since "msn" is a common verb listed in an official dictionary, it is public domain and free for everybody to use. To counter the argument, Microsoft has agreed with the editors of the Dutch dictionary to change the 2005 definition of "to msn" from "chatting using any messenger software" to "chatting using a Microsoft's messenger"... with an added © symbol. Microsoft is very sensitive about its "MSN" trademark being used in other people's product names, as proven in the past with their actions against eMSN and Everywhere MSN to name a few. Good thing we got off scot-free by choosing "Mess" for our site instead of "MSN" back in the pre-lawsuit period of 2001! There's always a scoop in the air when a Microsoft top-exec visits our little country, and it was no different when Steve Ballmer flew into Belgium yesterday. Together with a few fellow Belgian bloggers I was invited to an intimate Q&A with Steve during lunch, but it turned out a plenary press conference (and it got preponed, so I missed it in the first place). Too bad, because it's not hard to imagine a few recent developments to sound him out about. Anyway, one of the announcements made during the press conference will appeal to our commuting readers from Belgium. Our national railway company, N.M.B.S., is partnering with Microsoft to communicate general information (subscription renewals, special deals,...) as well as specific travel data (delays, platform changes, unexpected events,...) to its 350.000 daily travelers over the Windows Live platform. This information can be shared real-time and probably free of charge via text messages, e-mail or Windows Live Messenger (desktop or mobile), and also being considered is a Windows Live Agent (or bot) which can be queried about routes, connections, departure times and ticket rates. Testing will start the second half of 2008 among a thousand customers. Although Steve Ballmer mentioned similar collaborations with air travel companies (know any? tell us!) this is a worldwide first for a railway company. >> United Kingdom (grab this one worldwide), Belgium (French), Belgium (Dutch), Denmark, Germany, Norway and Sweden. PS: Remember to untick the two default options during the automatic setup if you don't want Microsoft to mess with your Internet Explorer settings. Microsoft sues over "anti-chat application"
Software producer Unicare Software has been sued by Microsoft, the company announced on Monday. Reason for the lawsuit, according to Microsoft, is the alleged infringement on the trademarked name MSN. 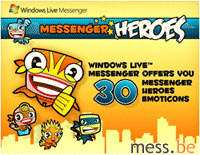 The application which prevents children from chatting for too long by providing parental controls, was initially named MSNLock. It has already been renamed to Benzoy however, which spurs the rumors (or should we say conspiracy theories?) that Microsoft is not really sueing for trademark infringement, but instead to stop the product, which prevents access to their Messenger Network, from being sold. Marc de Boer, attorney for the creator of Benzoy, Carola Eppink, is confident about winning the case: "The name of the product perfectly represents what it does. Plus, "to msn" has become a generic concept, a synonym for chatting."